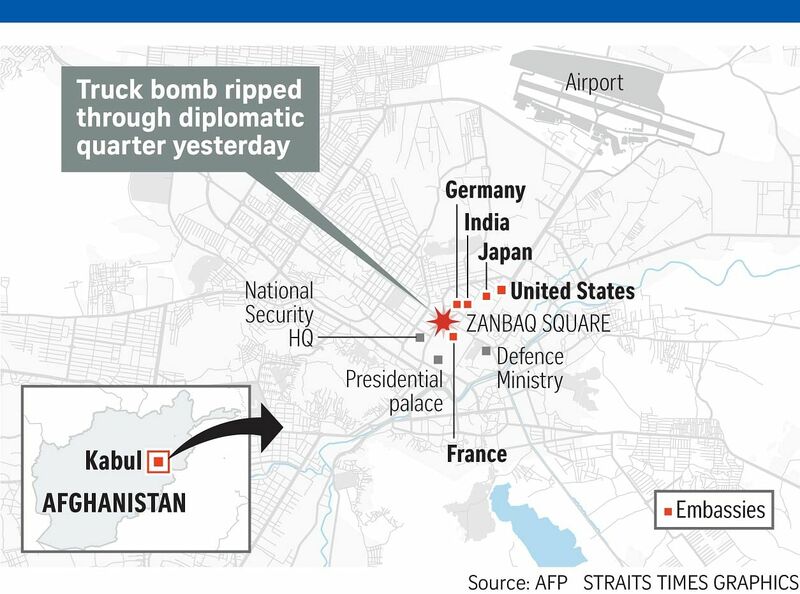 KABUL (Afghanistan) • A massive blast tore through the diplomatic quarter of the Afghan capital yesterday, killing at least 80 people and wounding more than 350, officials said. The devastation in a heavily fortified district left Kabul in shock and underlined the country's security struggles as it confronts a sustained wave of insurgent and terrorist attacks. Interior Ministry officials said a huge quantity of explosives, hidden in a water tank used to empty septic wells, triggered the blast during the morning rush hour on a busy boulevard in the Wazir Akbar Khan district, which houses embassies, banks, supermarkets and government ministries. It decimated an entire city block, leaving office buildings in rubble and charred vehicles strewn across the road in one of the deadliest single attacks to hit Kabul. Kabul's police chief, General Hassan Shah Frogh, said: "The blast was so huge that it dug a big crater as deep as 4m." Mr Wahidullah Majrooh, a spokesman for the Health Ministry, said that 80 bodies and 350 wounded people had been taken to hospitals. The scenes of human horror were appalling, even for a country accustomed to war and violence. At Wazir Akbar Khan Hospital, a steady stream of ambulances and police trucks delivered burned and mangled bodies, many streaming blood. Medical aides struggled to zip them quickly into body bags as distraught people crowded around, looking for missing relatives. The dead and wounded were almost all Afghan civilians and security personnel: policemen, bank clerks, cart pullers, telephone company workers. Five women were among the dead, officials said. Although many foreign offices are located nearby, there were no reports of foreigners among the dead. Some workers at diplomatic compounds, including those of Japan and Germany, were among the injured. No group immediately claimed responsibility for the bombing, which was followed by a second, smaller blast in another part of the city. Security agencies had warned that both the Taleban and Islamic State in Iraq and Syria (ISIS) were planning to attack high-profile targets in the city during Ramadan. 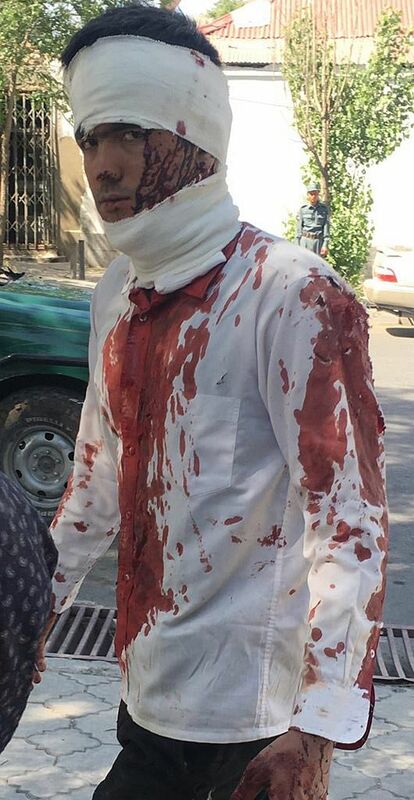 "I felt like it was an earthquake, and after that, I do not know what happened," said Mr Mohammed Hassan, 21, who was attending a training programme at the Azizi Bank, half a block from the blast, and suffered cuts on his head and arms. Nearby, distraught families squatted around bloody body bags, guarding them in patches of shade. There were muffled, choking sounds of men weeping. Most of the dead had been seared by the blast; some were wrapped in cloth, but others were half-naked and dripping blood. "What will I tell his children?" a sobbing man said into a cellphone as he knelt beside a bag containing the remains of his brother, a security guard. "Look, that one is a woman. Shame, shame," said an elderly man, pointing to a stretcher with a slender body wrapped in cloth. The government of President Ashraf Ghani issued a statement condemning the twin blasts as "heinous acts that go against the values of humanity as well as values of peaceful Afghans". It also said the attacks "demonstrate the extreme level of atrocity by terrorists against innocent civilians". But public anger at the government grew during the long rescue effort. "This is an inept government that cannot protect the people and must be dissolved. It is time for an interim government to be formed," said Member of Parliament Mirwais Yasini. The Ghani government, weakened by internal tensions, has faced an uphill battle to fend off an aggressive push by Taleban insurgents in recent months, as well as a number of assaults claimed by ISIS. There are 8,000 US troops in Afghanistan supporting the government, but earlier this year, their leader, General John Nicholson, said he needed several thousand more to break the stalemate.